Dr. Jeremy Ferrell, assistant professor in the Department of Sustainable Technology and the Built Environment, and graduate student Dan Blakeley discuss Appalachian’s Master of Science in technology. This program is housed in the College of Fine and Applied Arts' Department of Sustainable Technology and the Built Environment. Jeremy Ferrell: My name is Jeremy Ferrell, I’m an Assistant Professor in Sustainable Technology in the Built Environment. Dan Blakely: I’m Dan Blakely, I’m a graduate student for Appropriate Technology and Engineering Physics in the Sustainable Technology in the Built Environment and the Physics and Astronomy departments. JF: Right now we are in what we call the Warehouse, it’s an industrial building just outside of Boone and it’s where we house several of our hands-on projects. We’re here in the solar vehicle team’s research space, there is other research projects going on here as well. We do a lot outside of the classroom, outside of campus. We have facilities on Beech Mountain for wind energy, we have BioFuels facilities at the Watauga County landfill on State Farm Road. On campus, we’re located in Katherine Harper Hall. So, my research, one of the main things I’ve been interested in for years is looking at the carbon intensity of fuels in our transportation system, when we use gasoline in our cars or diesel in our trucks, what that means as far as environmental impacts. Naturally, this is evolved into looking at solar powered transportation, so when Dan Blakely and other students approached me about the solar vehicle team, I thought it was a natural fit for the kinds of things I have been working on for over ten years now. We’re interested specifically with this project in looking at emissions reductions with adoption of solar powered transportation technologies. DB: I just told them about this project we’ve been working on with the solar car, and I asked him if he wanted to be involved and he said “Absolutely” and it’s really evolved from there. Dr. Ferrell is probably one of the most approachable people, if his door is cracked open often times I’ll just tap on his door and walk in and so he’s absolutely very approachable, and it’s definitely great to have somebody who you can just walk into their office and talk to if you need to. You don’t have to schedule an appointment, you don’t have to call them and make sure that they’re available. JF: By having these real world projects, it really gives students the ability to empower themselves, and set their own goals, and do a lot of self directed learning. Dan and the group here with the solar vehicle team just exemplifies that. They have taken initiative in every aspect of the project. Everything from the most technical details of electronics and computer programming and mechanical, managing a team and fundraising, and logistics. I really see my role is to be able to continue to empower them to do these things where real learning happens. There’s only so much you can connect to in the classroom, but when there’s real world, hands on projects where people feel empowered, then I think that really accelerates things. DB: I originally chose Appalachian State for a few different reasons. One of my friends, who I actually served in the Army with, came here to Appalachian State University and I knew I wanted to get involved in sustainable technology of some sort. He told me to come out, at least visit him, and see the campus, see the area, and I really just fell in love with the Blue Ridge Parkway and the mountains, and the town. It’s a fairly large school in a small town, so you really get that small town feel which I like, I don’t really like being in a big city. But also, the program, from walking through his classrooms and stuff before I actually came to Appalachian, I saw it was a lot of hands-on learning, it was a lot of lab based learning, and so I wanted to be at a university that did that. I didn’t want to be stuck in a classroom that just had chalkboards and markers and a desk. I wanted to learn something by doing it hands-on. Pretty much in every class I’ve taken, if you have a really good idea of what you want to do, and it’s related to the content that they’re teaching in the classroom, there’s no reason why they don’t support the project to make sure that you’re able to complete it, and make sure that you have the technical knowledge to be able to do the work on it. JF: I mean, first off, we are the only school in North or South Carolina that has a solar vehicle team. We have a lot of innovative research projects, and I think most importantly there are opportunities to jump in and get involved and work with your hands and work on real world things. It’s not just going to be that you’re going to get handed off somebody’s research project and say “do this one little part”. You’re going to be able to really shape your own experience here and I think that’s one thing that’s really unique. 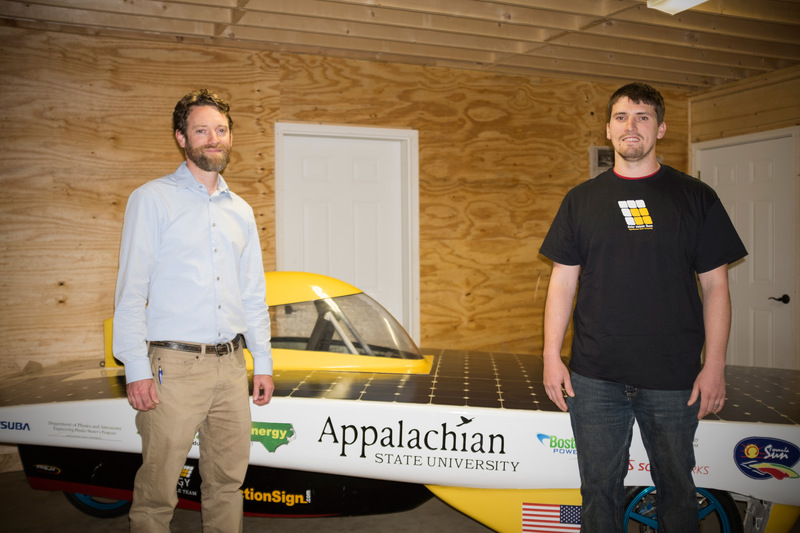 DB: So, if you’re considering coming to Appalachian State University, you should absolutely check out the solar car project. We’re doing something that not a lot of Universities get to be involved in, but at the same time, it’s a lot of engineering focused universities that are involved in solar vehicle projects, and us being a non-engineering specifically focused university--we’re kind of in a unique position--but we still have a lot of competitive spirit behind us. We’ve done good in the solar decathlon competitions, and we’re looking to do great in the solar vehicle world. It’s a unique experience, that’s a lot of fun. The College of Fine and Applied Arts is characterized by the educational approach of integrating theory and practice, offering students the knowledge and experience for continued education or employment. Programs within the College feature opportunities for hands-on experiential learning, international experiences and interdisciplinary engagement. The College emphasizes undergraduate teaching, while being active in grants and sponsored research. The College of Fine and Applied Arts provides a vibrant educational atmosphere, fostering the very best in teaching and learning. The Master of Science in Technology program focuses on sustainable technological development within the broad areas of renewable energy, energy efficiency, high-performance buildings and related topics. Considering graduate school? Masters really do matter at Appalachian State University! Get an inside peek into the graduate experience at App from our master-level students themselves. Learn why the masters programs at Appalachian stand out from those of other universities.